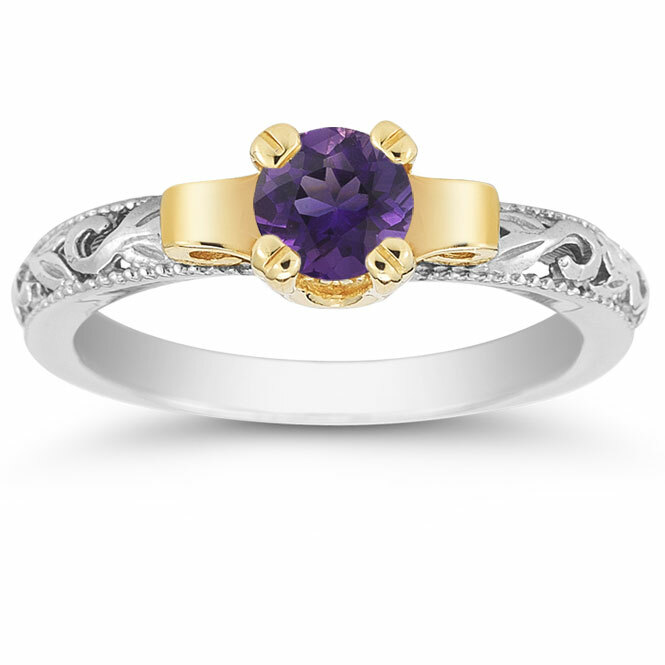 Amplify your jewelry collection with this amethyst ring from Apples of Gold. The two-tone ring features an art deco style that will speak volumes about your solid fashion sense. 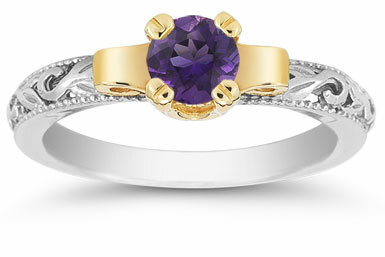 A 5mm amethyst gemstone gives a pretty focal point to this piece with its luscious purple hue. The gem is crowned by a yellow gold setting and is beautifully raised from the band. Cast in white gold, the band features decadent swirls that are outlined with by two milgrain edges on each side. Slip on this beauty of a ring and give yourself a reason to gloat. We guarantee our Art Deco Amethyst Engagement Ring, 1/2 Carat to be high quality, authentic jewelry, as described above.